WRC-TV, channel 4, is an NBC owned-and-operated television station located in the American capital city of Washington, District of Columbia. The station is owned by the NBC Owned Television Stations subsidiary of NBCUniversal. WRC-TV's studios and transmitter are co-located on 4001 Nebraska Avenue NW in the Tenleytown neighborhood in the northwest quadrant of Washington. WRC-TV houses and originates NBC News' Washington bureau, out of which the network's long-running political events program, Meet the Press, is based. The station traces its roots to experimental television station W3XNB, which was put on the air by the Radio Corporation of America, the then-parent company of NBC, in 1939. On June 27, 1947, the station received a commercial station license and signed on the air as WNBW (standing for "NBC Washington"). Channel 4 is the second-oldest licensed television station in Washington, after WTTG (channel 5), which signed on six months earlier in January 1947. WNBW was also the second of the five original NBC-owned television stations to sign-on, behind New York City and ahead of Chicago, Cleveland and Los Angeles. The station was operated alongside WRC radio (980 AM, frequency now occupied by WTEM; and 93.9 FM, now WKYS). On October 18, 1954, the television station's callsign changed to the present WRC-TV to match its radio sisters. The new calls reflected NBC's ownership at the time by RCA. It has retained its "-TV" suffix to this day, more than two decades after the radio stations were sold off. In 1955 while in college and serving as a puppeteer on a WRC-TV program, Jim Henson was asked to create a puppet show for the station. The series he created, Sam and Friends, was the first series to feature the Muppets, and launched the Jim Henson Company. The second presidential debate between candidates John F. Kennedy and Richard M. Nixon was broadcast from the station's studios on October 7, 1960. David Brinkley's Washington segment of the Huntley-Brinkley Report originated at WRC-TV between 1956 and 1970, as did Washington reports or commentaries by Brinkley or John Chancellor on NBC Nightly News in the 1970s. The earliest color videotape in existence is a recording of the dedication of NBC/WRC's Washington studios on May 22, 1958. As Dwight D. Eisenhower spoke at the event, introduced by NBC President David Sarnoff, it was also the first time a president had been videotaped in color. At the time of its sign-on, channel 4 was one of two wholly network-owned stations in Washington, the other being DuMont's WTTG. DuMont was shut down in 1956, and for the next 30 years WRC-TV was Washington's only network owned-and-operated station. That distinction ended when WTTG was sold to the News Corporation and became a charter station for the Fox network in 1986; it has since been accompanied by WDCA (channel 20) as UPN was owned by the station's owner Viacom until 2001 when Viacom traded the station to Fox (it is currently affiliated with the MyNetworkTV programming service). Today, WRC is one of three network-owned stations in the nation's capital, alongside the Fox Television Stations-owned duopoly of WTTG and WDCA. On January 1, 2012, digital subchannel 4.3 was discontinued as the network it was affiliated with, Universal Sports, began to be distributed to cable and satellite providers. On June 12, 2009, WRC-TV terminated its analog signal, on VHF channel 4, as part of the federally mandated transition from analog to digital television. The station's digital signal remained on its pre-transition UHF channel 48. Through the use of PSIP, digital television receivers display WRC-TV's virtual channel as 4. The station participated in the "Analog Nightlight" program, with its analog signal carrying information on the digital transition until analog signal broadcasts were permanently discontinued on June 26, 2009. 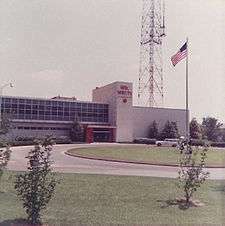 Beginning in 1996, WRC-TV's studios were the home of WHD-TV, an experimental high definition television station owned by a consortium of industry groups and stations which carried the nation's first program in the format transmitted by a television station, an episode of Meet the Press, and aired on UHF channel 34 to provide the FCC and the National Association of Broadcasters a channel to conduct many experiments in the new format. WHD-TV was discontinued around 2002. WRC-TV also has a Mobile DTV feed of subchannel 4.1, labelled "WRC NBC Mobile", broadcasting at 1.83 Mbit/s. This is the lowest bitrate of any D.C.-area television station mobile feed. In July 2009, the Washington, D.C. market's television stations became a test market for Mobile DTV, with WRC-TV as one of the participating stations. Like all of the D.C.-area Mobile DTV broadcasters, WRC-TV commenced full-time ATSC-M/H broadcasting on February 27, 2011. Syndicated programs broadcast by WRC-TV include Access Hollywood, The Ellen DeGeneres Show, and Steve Harvey, among others. WRC-TV is one of the four NBC owned-and-operated stations (along with sister stations KNSD in San Diego, WMAQ-TV in Chicago and WBTS-LD in Boston) that does not carry the newsmagazine show Extra. Because of its ownership by the network, WRC-TV generally carries the entire NBC network schedule, though NBC Nightly News is broadcast a half-hour later (at 7 p.m.) than most NBC stations in the Eastern United States, due to an hour-long 6 p.m. newscast. WRC-TV's building is home to Meet the Press, the longest-running program in U.S. broadcast television history, which debuted on November 6, 1947 and It's Academic, which premiered in 1961 and is the longest-running game show in television history according to the Guinness Book of World Records. Sam and Friends, Jim Henson's late-night precursor to Sesame Street and The Muppet Show, got its start on WRC-TV on May 9, 1955. WRC-TV has been the over-the-air home of Washington Redskins pre-season games since 2009, though before the NBC/Comcast merger, games only were carried in standard definition on WRC, with actual rightsholder CSN Mid-Atlantic airing the high definition broadcast. WRC-TV presently broadcasts 40 hours of locally produced newscasts each week (with 6½ hours on weekdays, 3½ hours on Saturdays and four hours on Sundays). By 2001, WRC's newscasts had all been rated number one in the market, with the long-running anchor team of Jim Vance and Doreen Gentzler. In the May 2010 sweeps, it placed first at 5:00 a.m., 6:00 a.m., 6:00 p.m. and 11:00 p.m. in total viewers, and first at 6:00 a.m., 6:00 p.m. and 11:00 p.m. in the 25–54 demo. It still leads most time slots today, although WTTG's morning news and WJLA's 11:00 pm news have given it much competition in the 25-54 demo. The news operation runs a nightly 7 p.m. program on subchannel 2 that consists of a single anchor covering the headlines with some of the afternoon newscast packages which the station does not consider a "full-blown newscast." In 1974, WRC-TV adopts the NewsCenter branding, the three other NBC owned stations in New York, Los Angeles and Chicago also adopted the NewsCenter branding. In 1980, the station adopts MFSB's song "My Mood" as a closing theme music for the 6:00 p.m. newscast every Friday, which is remained in use by the station today and Michael Randall commissioned the news theme for WRC-TV entitled "NewsCenter Theme", which is still remained until 1986; also, Charlie Rose hired by WRC-TV after its short sint at KXAS-TV in Dallas and hosted the Charlie Rose Show from its premiere in 1980 until he left the station in 1984 for CBS News, and the station also hires George Michael as Sports anchor, eventually they launched the program The George Michael Sports Machine, which is originated at WRC-TV from its debut in 1984 until 2007 (The George Michael Sports Machine was distributed by the station's sister company NBCUniversal Television Distribution). In 1982, after 8 years of using the NewsCenter branding, the news branding was changed into the Channel 4 News; also they add the 5:00 p.m. newscast in the mid 80s, the first in the Washington D.C. area history. In 1989, the news branding was changed again, this time the news branding was remained as News 4, which still remains today; concided with the name change, the station image campaign We Work Well Together, produced by Music Oasis, also adopted as news theme which last until 1992. In 1991, WRC-TV adds Weekday morning newscast under the title of News 4 Today, becoming the first morning newscast in Washington; also, On January 14, 1991, the station also produces the 7:30 p.m. newscast independent station WFTY (now CW affiliated station WDCW) entitled 7:30 News Headlines, the newscast suffered low ratings during its run and ended almost ten months later on October 25, 1991. In 1993, the station adopts the news music theme entitled Working 4 You, which also serves as a current station slogan, 615 Music remixes the theme in 1997, this time under the title of Working For You, the theme was also used by other NBC affiliated stations (including WHO-TV in Des Moines, KPLC-TV in Lake Charles, WPSD in Paducah and WEAU-TV in Eau Claire). In 2002, WRC-TV adopts The Tower news theme commissioned by 615 Music for Chicago sister station WMAQ-TV with the notes of the Working For You theme as a musical trademark added only in the news opens. The "Working For You" theme will continued to use as closing theme for all of its newscasts. both "Working For You" and "The Tower V.1 with Working For You" which both in use by the station until 2008, when they switch to Gari Media Group's "The NBC Collection" now with added notes of the "Working For You" theme. On January 14, 2009, WRC-TV and WTTG entered into a Local News Service (called LNS) agreement in which the two stations pool video and share news helicopter footage. The agreement is similar to ones already made between Fox and NBC owned-and-operated stations in Chicago (WMAQ-TV and WFLD) and Philadelphia (WCAU and WTXF). WUSA later joined that agreement. In 2012, News Director Camille Edwards announced the station would no longer participate in LNS, but the stations would continue to share the helicopter. On April 8, 2010, the station began test broadcast of its news programming in high-definition during local news updates seen during Today; regular newscasts continued to be broadcast in standard definition. WRC-TV started broadcasting its newscasts from a temporary set on February 8, 2010 while "upgrades" were being made on its main set and the station made final adjustments for its switch to high definition. On April 22, 2010, WRC became the fourth (and final) English-language television station in the Washington, D.C. market to begin broadcasting its local newscasts in high definition. It is the only station in the Washington market that shoots most of its remote field video in 16:9 widescreen; other stations still shoot live field video in 4:3 and then either pillarbox or stretch this content to widescreen—though WRC's field video is shot in standard definition. On September 15, 2014, the station's newscasts shifted to a full 16:9 widescreen presentation, therefore becoming the third English-language television station in the Washington, D.C. market to do so, following Tegna-owned CBS affiliate WUSA (January 2013) and Fox O&O WTTG (August 2013). In conjunction with this, the newscast title was changed to a variation of the station's NBC 4 logo and also, its longtime newscast theme music was heavily updated. Also, the station's "Look F" graphics package from NBC ArtWorks, which was introduced 2 years earlier (May 2012), was reformatted for the 16:9 presentation. On June 29, 2016, the station officially began using the "Look N" graphics package that was first adopted by sister station WNBC (which began using the package on June 11), becoming the sixth NBC-owned station to use this package, following WVIT (June 13), WTVJ (also on June 13), KXAS-TV (June 20) and WMAQ-TV (testing on June 21; full usage beginning June 28). ↑ "RCA replaces NBC in O&O calls." Broadcasting - Telecasting, October 4, 1954, pg. 78. ↑ Sickels, Robert C. (Aug 8, 2013). 100 Entertainers Who Changed America: An Encyclopedia of Pop Culture Luminaries [2 volumes]: An Encyclopedia of Pop Culture Luminaries. ABC-CLIO. pp. 253–258. ISBN 1598848313. Retrieved September 23, 2014. ↑ "RCA-NBC Firsts in Color Television". Archived from the original on February 6, 2006. ↑ "Eisenhower WRC-TV 1958 (oldest known colour videotaping)". YouTube. ↑ Brinkley, Joel (March 3, 1997). "Warts and Wrinkles Can't Hide From High-Definition TV". The New York Times. ↑ "Mobile DTV Station Guide - www.omvcsignalmap.com". ↑ "Fox And NBC To Share In DC". Retrieved 2009-01-14. ↑ "Atkinson throws in towel". The Washingtion Times. ↑ "Shannon Bream to Cover Supreme Court for Fox News". ↑ "Former News4 Sportscaster Nick Charles Dies of Cancer at 64". NBC4 Washington. ↑ "Couric's days at WRC recalled - Washington Times". The Washingtion Times. ↑ "Lindsay Czarniak, sports anchor, to leave NBC4 for ESPN". Washington Post. ↑ "Dan Hellie joins NFL Network". Washington Post. ↑ "Leonard Shapiro: Loss of Michael Is a Truly Deep Cut". The Washington Post. December 29, 2008. ↑ "Bob Ryan retiring after 33 years of TV weather forecasting". WJLA. 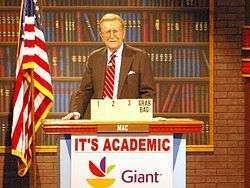 ↑ "Willard Scott, weather reporter and centenarian birthday greeter". TODAY. Wikimedia Commons has media related to WRC-TV.